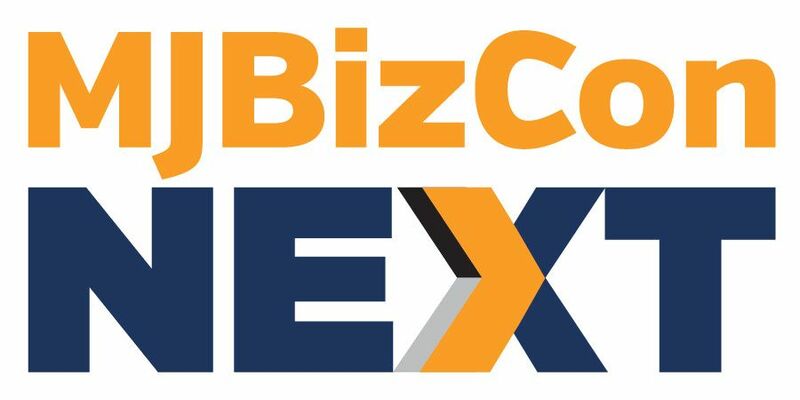 While Germany is on track to become one of the largest federally legal medical marijuana markets in the world, a lack of publicly available data on consumption makes it difficult for companies to assess the actual market opportunities. Unlike Health Canada, German authorities don’t publish centralized statistical information of the number of patients or amount of medical cannabis sold within a given period. 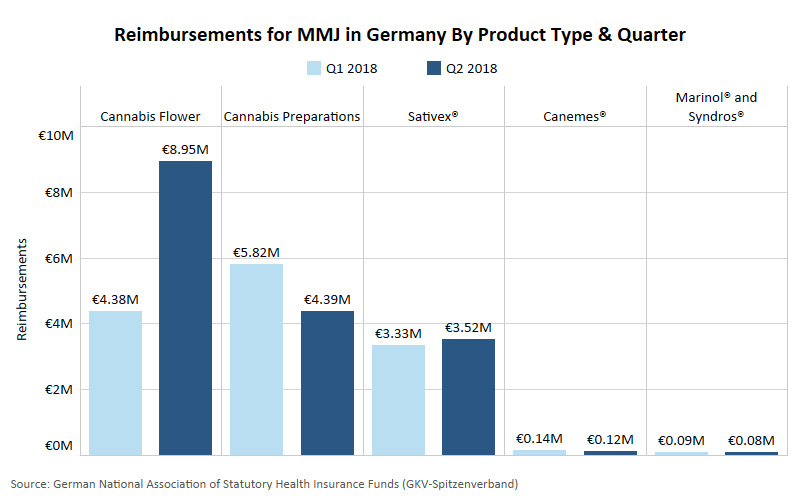 However, the German National Association of Statutory Health Insurance Funds (GKV-Spitzenverband) does publish data on insurance reimbursement for medical cannabis – 30.8 million euros ($36.2 million) for nearly 80,000 prescriptions during the first half of 2018 – that can serve as an indicator of market demand. Cannabis flower represented 43%, with reimbursements totaling 13.3 million euros for the six-month period. Based on the average retail price (slightly above 20 euros per gram), roughly 100 kilograms per month of medical cannabis flower was reimbursed in Germany during the first half of 2018. And sales trajectory is rising, which means Germany will need to continue to look elsewhere to meet the growing demand – even as the country is trying to get its domestic cultivation program off the ground. Earlier this summer, the Netherlands agreed to increase annual exports of medical cannabis to Germany from 700 kilograms to 1,500 kilograms. During the first half of 2018, Germany imported 1.62 metric tons (1.8 tons) of cannabis, according to trade publication Apotheke Adhoc. About 60% of those imports came from Canada and 40% from the Netherlands. Canopy Growth, one of the largest Canadian cannabis companies exporting to Germany, reported that it sold an average of 70.5 kilograms a month to German MMJ firms during the first half of the year at an average price of $13.50 per gram. The retail markup nearly doubles that price for patients and insurers. While the reimbursement of cannabis flower more than doubled from the first quarter to the second, reimbursement of “cannabis preparations” decreased. Medicine containing dronabinol, produced by the German company Bionorica. Ground cannabis flower, as prescribed by a physician. Authorities from the GKV-Spitzenverband told Marijuana Business Daily they have no way of knowing the proportion of each of these three products within the preparations category. But an analysis of Tilray’s latest financial results shows the company exported less than 500,000 euros worth of product to several countries. That total is less than 5% of the more than 10 million euros of cannabis preparations reimbursed in Germany during the first half of the year. Because ground cannabis flower is rarely prescribed, most of the cannabis preparations reimbursements likely come from dronabinol products made in Germany. 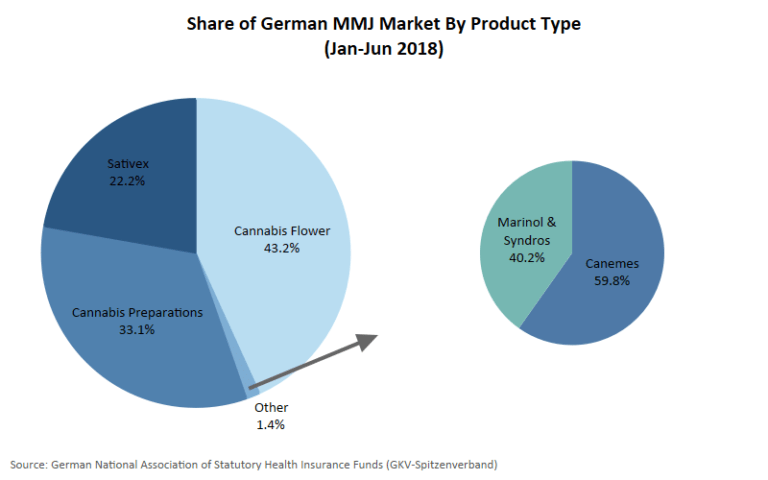 While the Statutory Health Insurance covers about 90% of Germany’s population, it has been reported that about a third of the applications for reimbursement of cannabis prescriptions aren’t successful. The country has no way of tracking patients who independently pay for their medical cannabis prescriptions. The German government says it wants to meet some of the market demand for medical marijuana with domestic grows and has set a deadline of Nov. 5 for applications to participate in the first round of permitting. But the first attempt to issue permits last year was derailed by lawsuits, so there is some skepticism about the willingness of the government to fully implement the medical cannabis law. One of the criticisms of the first tender was that it allowed the cultivation of only 6,600 kilograms of medical cannabis flower over a period of four years. The new tender increased that quantity to 10,400 kilograms, with the possibility of increasing it an additional 30% if needed. German authorities clarified that the country won’t export any medical cannabis. In case of overproduction, excess product will be destroyed. In the previous public tender, proving experience in growing medical cannabis under certain conditions was required. In the new application, companies can fulfill the minimum requirements by proving experience growing other medicinal plants. Depending on the results of the tender, there will be a minimum of three companies and a maximum of 13 growing medical marijuana in Germany, with total yearly production of 2,600 kilograms at the start. I am in Thailand We do invest in Lao for recycle industrial and mining. Now we apply for License for grow and extract marijuana ( cannabis ). they will give us 160 hector to grow. and for Hemp they allow us to grow. Yes we can help you. Please detail specifics. Where is your license? How can I contact you, Brenda? Hi Brenda, My name is Alejandra, I am in Colombia were Medcinal Cannabis was legalized two years ago, i am pursuing a license (wich i’ll have in 2 months) so i’ll be in a similar situation as Charung Vong’s … how can we contact?